This plating is well known for different industries, at AUGE we offer our product with four different classes of this plating depending on the thickness and according to the standard ASTM B633 these are 5, 8, 12 and 25 μm. This plating is common used by the oil & gas and petrochemical industries, on offshore and onshore applications according to the class and that depends on the thickness 5, 8, 10, 12 and 25 μm. 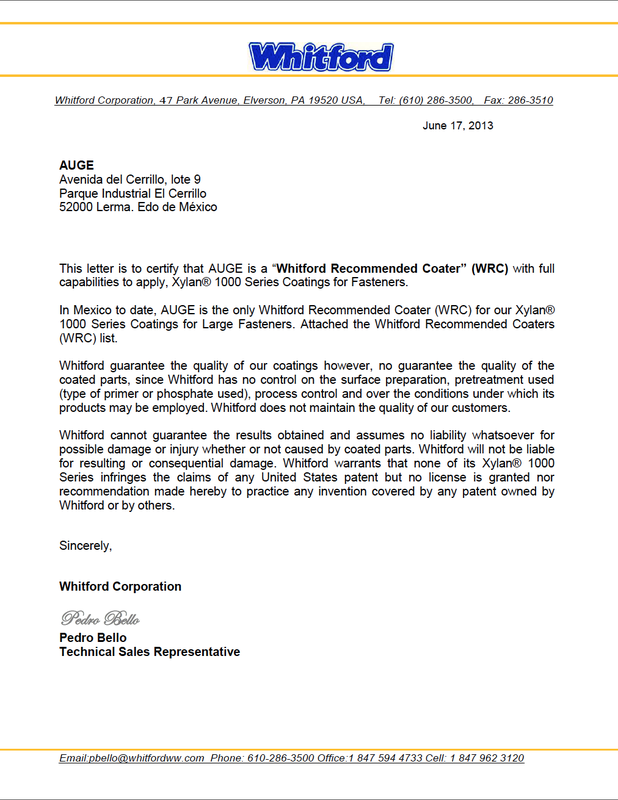 AUGE recognized as an approved and recommended coater by Whitford applies this coating which is generally used by the oil & gas industry because in addition to protect form corrosion it offers a low friction coefficient and improves wear resistance. We offer this coating in different types: 1424, 1425, 1052, 1070 and 1014, which are the specific types for the oil & gas industry and also different colors such as: blue, black, red and green. 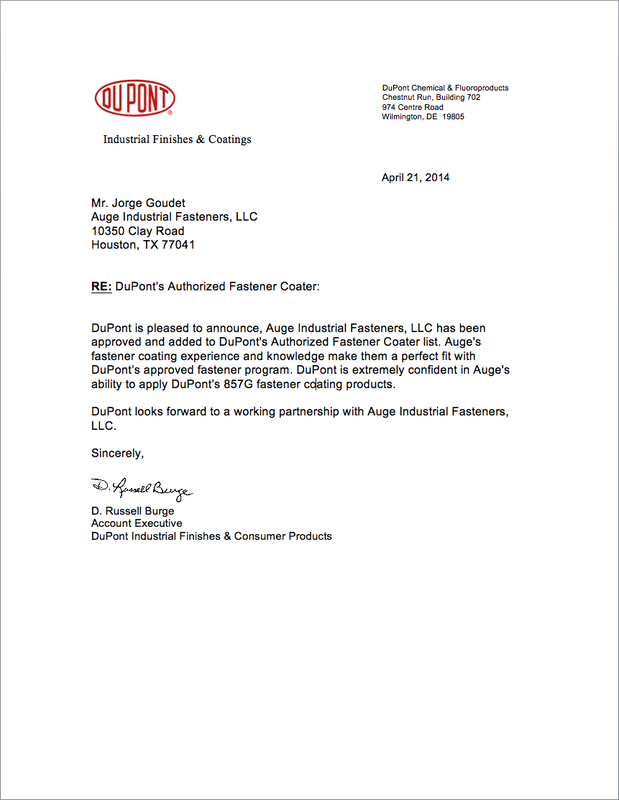 AUGE recognized as an approved and recommended coater by Dupont applies this coating which is generally used by many different industries but it has been discovered that it can resist the most corrosive environments, specially designed for coating off shore, chemical processing, and water treatment fasteners on substrates such as carbon steel, stainless steel, and aluminum. Traditionally, hot-dip galvanized steel is specified for its superior corrosion protection, especially in harsh environments. Though corrosion resistance is inherent any time galvanizing is utilized, more and more specifiers select hot-dip galvanized steel for other reasons, including lowest initial cost, durability, longevity, availability, versatility, aesthetics, and sustainability. It’s a coating for fastening elements, applied mainly on surfaces where is hard or almost impossible lubricate with grease and traditional oils, due to the fact that it works as a dry lubricant, reducing friction coefficient and repelling dirt and dust. This coating is designed to provide outstanding salt corrosion protection and UV resistance to our fasteners and components exposed to offshore and subsea environments. This Plating was developed by Industrias AUGE to be used in highly corrosive environments where a superior resistance is desired, such as environments with presence of sour gas (H2S), It bears excellently environments with presence of sulfide and chlorides in an acid level.